With Easton’s newest version of the Mako, a lot of new improvements have been made. The biggest one would have to be the padding around the ankle area. The new skate pads are dramatically better and more comfortable than the previous version. 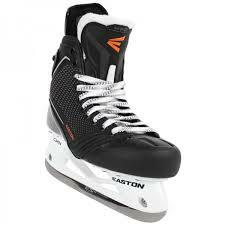 These skates heat so well to really give that glove like feel. The soles of the skates have a proffesional thickness to them but at the same time do a great job at managing water going into the vents at the bottom of the skate and keeps dry. Tenden gaurds are usually pretty stiff but not with the Makos. The Makos have a very flexible gaurd that alows longer strides and more freedom in your skating. This really gives you a free range of motion and also has great padding that keeps it from digging into your calf. 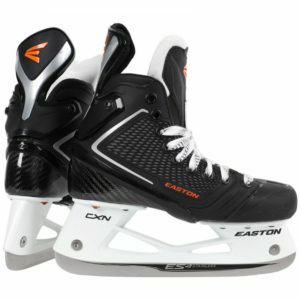 This is a pro level skate and like most pro level skates this has a nice thick tounge and keeps you safe from lace bite. Now let’s talk about the lower half of this skate and why it is built for major explosive strides. The over all foward pitch keeps you on your toes which gives amazing leverage in your strides. The CXN holders have a nice high profile to them which will help you have those nice aggressive leans and also very well supports explosive strides. Over all this skate was designed for the explosive and fast skater out there that needs this kind of support. A great skate.